This is a Four Pinocchio claim, yet Trump keeps repeating it when he’s pressed on family separations. Repetition can’t change reality. There is simply no comparison between Trump’s family separation policy and the border enforcement actions of the Obama and George W. Bush administrations. In April 2018, the pilot took off. Then-Attorney General Jeff Sessions rolled out a “zero tolerance” policy of prosecuting all adults caught crossing the border illegally. The next month, the Department of Homeland Security began to refer all illegal-crossing cases to federal prosecutors. This meant systematically separating all families caught crossing the border. Minor children can’t be prosecuted with their parents, so the government separated and reclassified them as unaccompanied children. A federal consent decree mandates that unaccompanied children be released within 20 days to a relative or child-care facility. The Trump administration has identified more than 2,700 children covered by a court order mandating family reunifications. But the real number is unknown and could include thousands more. The zero-tolerance approach is worlds apart from the Obama- and Bush-era policy of separating children from adults at the border only in limited circumstances, such as when officials suspected human trafficking or another kind of danger to the child or when false claims of parentage were made. Trump did not end that particular policy, which is still in effect. He issued an executive order on June 20 to end his own much broader policy of systematic family separations. “Prior to the Trump Administration, aliens apprehended between ports of entry who were not considered enforcement priorities (e.g., a public safety threat, repeat illegal border crosser, convicted felon, suspected child trafficker) were typically not criminally prosecuted for illegal entry but would be placed directly into civil removal proceedings for unauthorized U.S. presence,” according to a February report by the nonpartisan Congressional Research Service. However, DHS officials said they referred to prosecutors an average of 21 percent of “amenable adults” who were detained between ports of entry from fiscal 2010 to 2016. Regardless, prosecuting 21 percent is much lower than prosecuting 100 percent. That’s what Trump’s zero-tolerance policy called for, because it applied to all adults, regardless of whether they asked for asylum or had children in tow. After making these latest remarks in the Oval Office on April 9, Trump tweeted a video montage of news reports showing children in caged enclosures during the Obama administration in 2014. That doesn’t mean Obama systematically separated families, as Trump did. We’ve already given this claim Four Pinocchios. 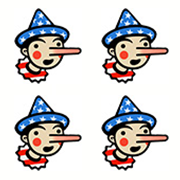 We’ve given Four Pinocchios to a related claim: that several laws and court rulings were forcing family separations. We also gave Four Pinocchios to the Trump administration for giving the public incomplete numbers on family separations and reunifications. We’ve given these claims as many Pinocchios as we can possibly muster. That is, except for the Bottomless Pinocchio, which is getting closer and closer.